Global measurements show that 2008 was 0.2 degrees colder than the hottest year so far recorded, which was in 1998 – the red dot pointed to by the green arrow in the above graph is the measured 2008 global temperature. This value follows a trend of several cooler years this milenium. As a result of this recent data the IPCC predictions of temperature rise due to increasing CO2 are beginning to look a little in disagreement. My thanks to Prof. Hukui for bringng my attention to the work of Prof. Akasofu at the University of Alaska who argues that most of the observed rise since 1800 is actually due to the earth recovering from the little Ice Age in the middle ages superimposed with a natural multi-decadel variation. Selective global temperature plots used by the climate change scientists data usually argue that the significant rise of temperature since industrialisation is direct evidence that increases in CO2 emissions are the cause. While CO2 has a proven greenhouse gas effect the modellers still have large uncertainties as to its global quantititative effect and actually tune the parameters in the models assuming that all the observed temperature rises are due to CO2 alone. They ignore the possibility that other natural effects may be at work. This then leads to future large temperature rise predictions of 2-3 degrees by the end of this century. Akasufo’s paper can be downloaded here . He brings together a large range of independent data as evidence that the world has anyway been slowly warming since around 1800 after the end of the little Ice Age which lasted from around 1500 until 1800. In medieval times from the Roman era to around 1200 a much warmer climate existed on earth. Circumstantial evidence for this is well known e.g. wine was grown in northern England during the Roman period, while the Thames used to freeze over during the middle ages. 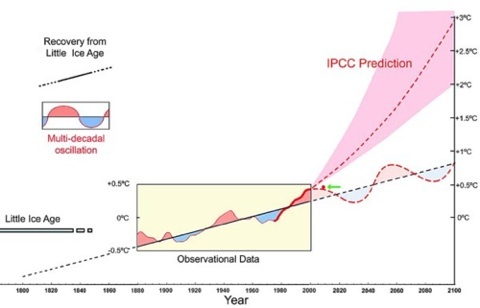 Superimposed on these longer term trends are, he proposes, a multi-decadal oscillation, which although not explained here has been previously associated with things like sun spot activity. If these ideas are right then the next 5-10 years will continue to see cooler temperatures by which time the IPCC predictions will then be looking in serious trouble. Humans are having a huge effect on the planet mainly because there are too many of us. We have already transformed much of the arable land coverage to feed ourselves. However the idea that one single issue – burning fossil fuels and the associated increase in CO2 dominates all others has always seemed to me a little simplistic. Good science will always prevail, so if CO2 emissions really is the dominant driver for global warming then predictions must be validated experimentally. Interestingly it just maybe that the evidence is starting to hint at something else. The next 10 years should decide.